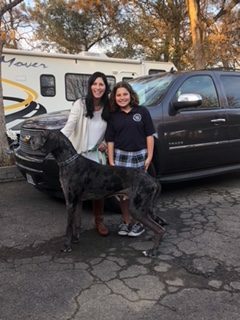 Percy gets a ride –and a family ! 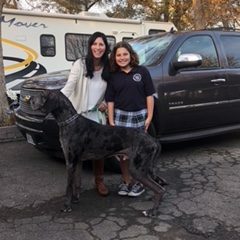 A woman reached out to us late March to surrender a Dane she only had four months. Unfortunately her male boxer was not thrilled about another male in the house and the fights began. She assured us that it wasn’t Percy’s fault but she didn’t want one of them seriously hurt. With her location and work schedule it was difficult coordinating a time to bring him to the rescue. When she finally was able to come, the kennel in the Sacramento area couldn’t take him. Lucky for all, a family on our list volunteered to transport him to Reno. Once they arrived, I received a call that they wanted to adopt Percy. He met the whole family and everyone approved. Percy found his forever home. Everything happens for a reason. Percy makes friends a family on his ride to rescue ! Michael and Blake sold their condo and moved to a farm. 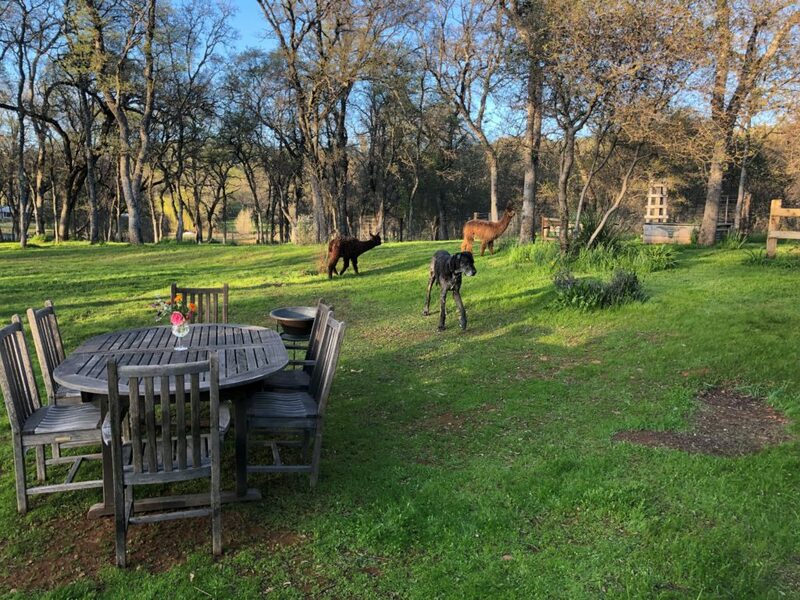 So far they have three sheep, two alpacas and a rooster. Congratulations on living your dream! “These two big male Danes are gentle giants. They love each other, and are deeply imprinted. We’ve watched them change each other. It’s been amazing. They play rough, wrestle hard, and have zero negative altercations. Levi takes toys right out of Gideon’s mouth, and Gideon isn’t the slightest bit bothered by it. Gideon has been the most flexible, accepting dog you could possibly imagine. No jealousy…and no reaction at all to having a big, crazy new buddy in the house. No reaction except love. They have separate beds, but never sleep apart. Levi still suffers from a little bit of separation anxiety, but we are working our way through that, and he’s gotten much better. “Adoption” photo of Charlie and part of his new family, the Brocatos. We are so happy Charlie found a great, loving new home. They are working on teaching him some house manners, and we appreciate them being willing to work with this sweet boy. Next photo is Charlie trying to sleep with someone snuggling against him. I’m sure Charlie is thanking his lucky stars he is home! “Dory is doing great. She and I are close friends. Dory is getting better around Gary and makes sure to get a pet from him each night but still skitters away half the time when he tries to pet her any other time. Ryan on the other hand is still working hard to gain her trust. Even though he gives Dory a treat every day she still jumps away from him whenever she sees him. She does take the treat now so that’s a little progress. When we go for our twice daily walks she runs and runs so I guess she likes the open spaces. Gary welded a special eating and watering station so we’ve gotten over her not eating. Maybe it was the enclosed porch that bothered her. As soon as we moved feeding to the side porch outside she was fine. Here is a narrative from a recent adopter (thank you Mark!) on his experience with a rescue Great Dane. We think it may offer some help/support/comfort to potential adopters! “My wife and I love Great Danes. No…I mean REALLY, REALLY love Danes. When we got married, the choice was kids or Danes first. We chose Danes. We’re now on our fifth Dane. (The kids are now grown and out of the house. ) The only downside I can think of to the breed is that they don’t live long enough. But you get twice the love in weight…so it makes up for it. 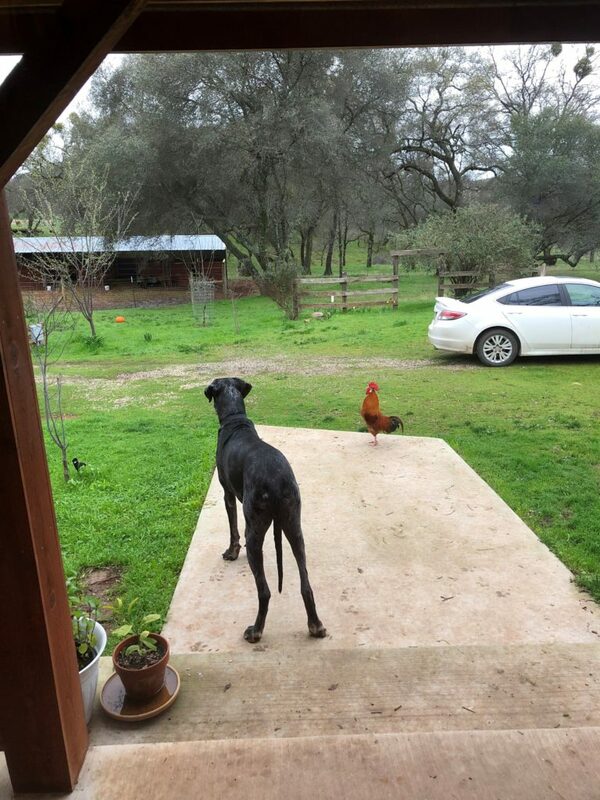 We recently rescued a 19 month old Great Dane, to give our almost three year old male Harlequin, Gideon, a friend. With both the kids now out of the house, we were ready. Or so we thought. 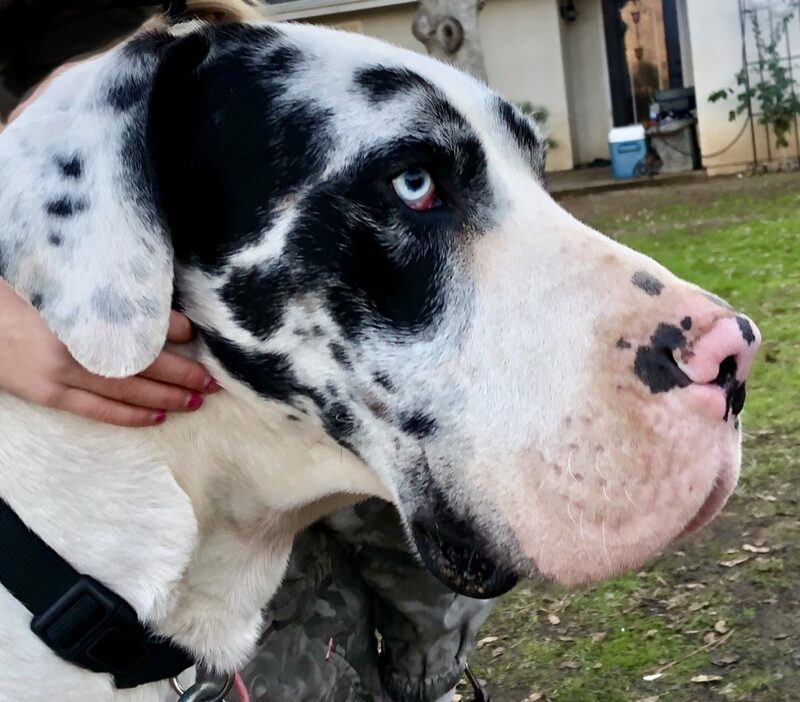 We found Levi (formerly Bently) online at Great Dane Rescue of Northern California. He’s a beautiful Merle / Mantle, with bright blue eyes. We were drawn to him from the start. We brought Gideon for a visit at the kennel where Levi was temporarily housed and fell in love. Gideon too. They played together well, if a bit rough. And Levi seemed desperate to be loved. He had spent many months without attention in someone’s backyard. He had been so neglected, he didn’t know his name. He needed a family to love. He literally wrapped his body around our legs to get closer to us. We couldn’t resist. We decided to come back the next day and bring him home. We’ve never rescued a full grown dog before. We’ve always had puppies. And we never even gave a moment’s thought to how different this would be than that. You see, just like people, dogs come with a history. And with dogs, you really never know the real history. That means they come with all kids of hidden personality traits, some good, and some not so good. We brought Levi home, introduced him to Gideon and all seemed well. They were a bit wild together but seemed to get along famously. They played all day, and slept together that night. All was well. Or so we thought. Levi fit right into our routine and Gideon was thrilled. The next day started with more “routine.” We headed out for a long hike with the dogs. We took them to the trailhead, leashed them up, and started out. Everything was fine, until we came across our first unknown dog on the trail. Levi became extremely aggressive. He was almost impossible to control. It was a very bad scene. No one was hurt, but we were stunned, and shattered. It seemed clear that we had adopted a “bad dog.” We talked…we cried, and we called the adoption folks and said we were returning him. We made arrangements and drove down to the kennel. When we dropped him off, he was frantically looking for us as we pulled out. We cried all the way home. We were heartbroken. I went online to do what I should have done before bringing him home in the first place. I researched…”how to bring home an adopted dog into a home with an existing dog.” There was a wealth of information. There were many do’s and don’ts, and we had violated virtually of all them. I felt stupid. I know better. I’m a researchaholic. But in this case, my excitement overrode my common sense. For the next couple of nights I dreamt about Levi…I saw his blue eyes, and how much he wanted to be loved. And I knew that we had done wrong…not him. We talked about it a lot. We debated back and forth. And ultimately, we did something scary…we went back and got him. And we brought him home. And we followed the advice we found online. We took our time. We went slowly. We didn’t introduce him to anyone, or take him out for a couple of weeks. We wanted him to know he was safe and secure. We wanted him to understand that he had pack leaders who would take care of him, and protect, and who he could trust. And we wanted to learn to trust him too. Trust is a two way street. There’s a lot to it. It’s complicated to bring home a rescue. It’s not like the movies. It’s not all cuddles and cuteness. These dogs have histories. They don’t know you. They don’t trust you. And you shouldn’t trust them…immediately. That trust has to be earned; both ways. And it takes time, and patience, and commitment, and lots and lots of love. But if you commit to it, the rewards can be incredible. It’s been almost five months since we brought Levi home. There’s been a lot of learning. He’s had to learn our rules, and we’ve had to learn his personality and his quirks, some good and some not so good. We’ve all had to adjust. It’s been a process, and it’s continuing. It’s still a work in progress. He still has a bit of separation anxiety to work his way through. But it’s getting better every day. And overall, it’s really, really good. We love Levi…and he loves us. Levi and Gideon are inseparable. We have two beds, but they sleep together. Gideon has been the ultimate, patient and loving big brother. We haven’t seen a jealous moment. Levi is well adjusted and goes out with us all the time. We still discover things about him (and him about us), and we’re still working out a few kinks, but we wouldn’t trade him for anything. This dog loves to be loved as much as any dog we’ve ever had. And there’s something special about looking in your dog’s eyes and knowing that you rescued him…that he really, really needed you. All Levi wanted was to be loved; and all we ever wanted to do was love him. But it was more complicated than that when it came to reality. That’s an important lesson. So here’s my brief advice for those wanting to adopt a Great Dane. Do it. The returns are incredible. 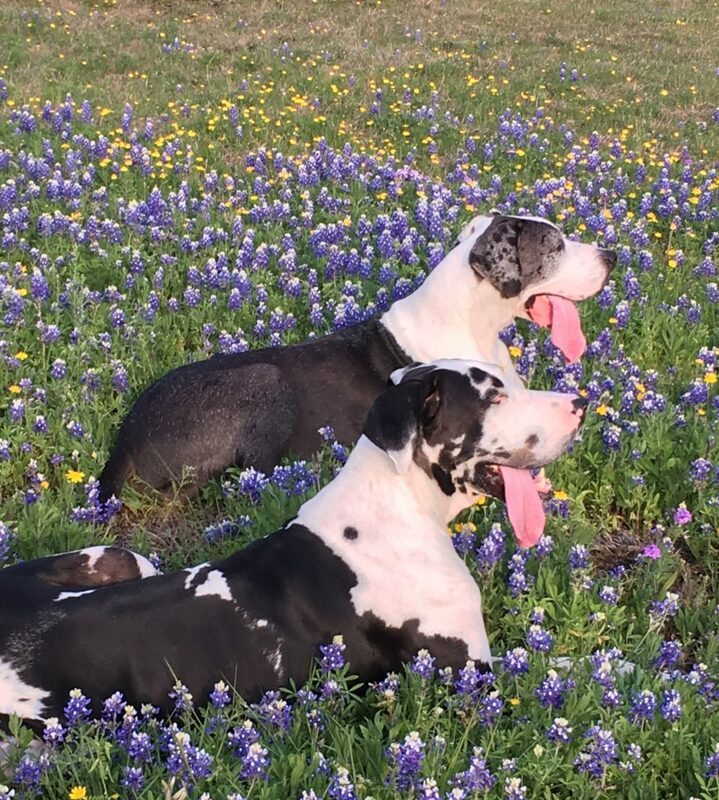 They are the best breed in the world (and yes…of course I am biased). And there is something special about a rescue. Don’t do it without thinking it through and doing your homework. There is a right way and a wrong way to bring home a rescue dog. It is not the same as bringing home a puppy, and there will always be surprises. Be prepared to put in the time researching and preparing, and be prepared to put in the time when you bring them home. You must commit. And if you don’t have the time or the energy or the flexibility for that, don’t do it. Be patient and take it slowly. It’s all new for your new dog. You may love them immediately, but they don’t know or trust you when you bring them home. Be careful and cautious. Big dogs may seem cuddly, but they can be dangerous too. They can do damage to you and your stuff. I’m not saying that to scare you…just telling you to be very cautious. Because you don’t want a mistake that can cause an incident that ruins an otherwise good adoption (like we almost did). Let your new dog adjust slowly. Don’t take them out in public for at least a couple of weeks. Limit outside visitors for awhile too. Your dog needs to get to know you, and the pack at home, before you introduce other people. Take the time so that they trust you to protect them, and they know you are in charge. You must be a calm, assertive pack leader. Your new dog needs that from you. Commit. Don’t give up. These dogs have already had to deal with the instability of losing their family home. Maybe more than once. Don’t be part of their history. Be part of their future. I’m sure there’s a lot more. Someone should write a book. And we’re no experts, so it’s not us. But we have been through it, once. And we made mistakes. Thank God we decided to give it a second try. Remember, we thought we had adopted a “bad dog.” But he wasn’t a bad dog, we were bad adopters. But only because we didn’t know. We hadn’t done our homework. So don’t let me scare you off. I’m encouraging you to do it…but do your homework, be prepared and be committed. If you do, you won’t be sorry. Our own Lori Lynne and Eric’s sweet girl Priscilla recently passed on. We want to extend our heartfelt sympathy to them on the loss of their beloved girl. Lori Lynne and Eric kept Priscilla going many months after medical problems arose. They went above and beyond what most people would have done to make Priscilla happy and gave her quality of life. We are so sorry she lost her battle, but know she crossed over in Lori Lynne’s arms in her own home, as peacefully as could be. Just wanted to give you an update on Bella. She is doing AMAZING, and she is so much apart of the family it feels like she has been with us from day one. She is one the sweetest dogs that I have ever been around, with a human personality. Sometimes when she does things we just laugh because it different for us. In the morning I watch the news and she sits on the couch right next to me staring at the TV like she knows what is going on. She sleeps on her dog bed through the day but she has to sleep thespyexpert in my bed at night, and she makes sure she has a pillow, I couldn’t ask for a better dog. She has gained 10 pounds and looks healthy 🙂 I can’t thank you enough for her, she is simply the best. I adore her. Sadly, we lost one of our most precious GDRNC members and a wonderful friend, John Martin. John lost his brave battle with bactrimsale.com cancer with his devoted wife, Karen, by his side. John and Karen manage the Reno, NV area for Rescue, and have been invaluable members of our group. John was one of those people who you liked right off. I think it is rare when you meet a man like John, who was truly one of the nicest, most decent men I have ever met. This was a good guy. 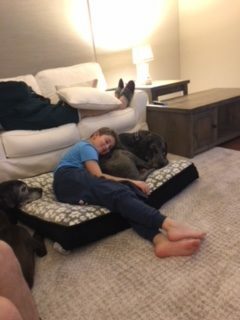 He loved his own rescued Danes with calm, tender love, and was protective of the sad fosters that came into his and Karen’s home. The joke was that we always worried when a Dane came to stay with John and Karen, that it would never leave. Karen would tell me John would say to her each and every time a new rescue came into their home, “Karen, we HAVE to keep this one. No one will adopt it.” John felt a connection with every animal that came into his life. We are all better for having known John Martin. Our sincere condolences to his wife Karen, who we know will continue John’s good work with Rescue. When you met my husband, you could see he was a nice guy. If you were fortunate to spend time with him, you would see a wise, funny, caring man. If you liked to golf, fish or go shooting, you could be best buddies. Since moving to Reno, we’ve brought in sixteen foster Danes. John never wanted to let any of them go. 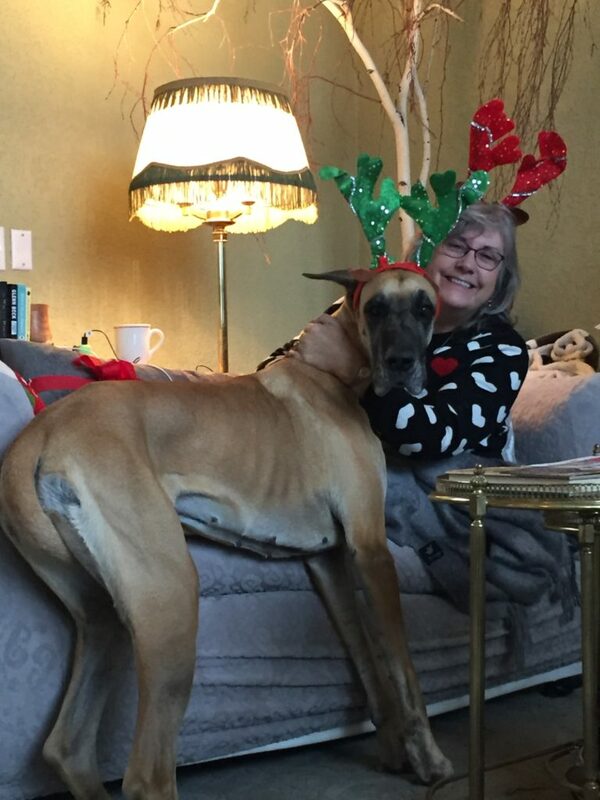 He was so proud to say we fostered for the Great Dane Rescue. He was a Great Dad to all the “kids”. I am so grateful to him for this, for it completed us as a couple. John showed you can be happy, life is wonderful and love lasts! 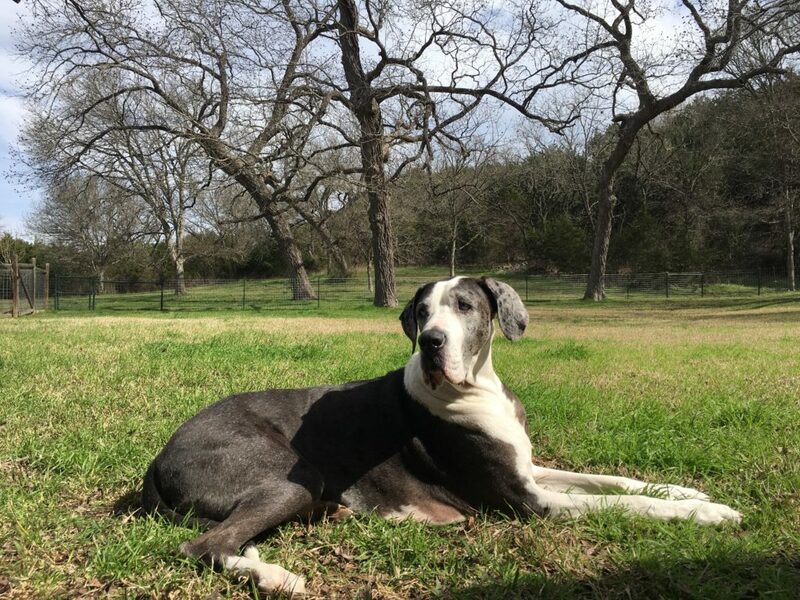 Cathy (our rescued Great Dane) and I miss him so very much. Gator is doing very well for such an insecure fellow. We have determined he is not a vicious dog, but mostly very scared of others. He is incredibly frightened of anything that looks like a hose. I have found a vet who understands this and doesn’t feel the need to immediately muzzle him. Our vet is about 5’4″ and Gator regularly touches noses with her. He does seem to favor women over men, so far he has added my husband, our son and a close male friend to his “male repertoire”. He has many more female friends. Makes you wonder what happened to him in his about it previous life. He is getting white in the muzzle and prefers sleeping by the heater, but when the spirit moves him he is quite rambunctious. We love him. Thanks again for finding him for us. Editors Note: Kincade (Gator) came in very thin and dirty, and the owners were sparse on sharing info on him (language barrier). Virginia and her husband adopted him and had some trouble at first, but stuck with it and worked it out. 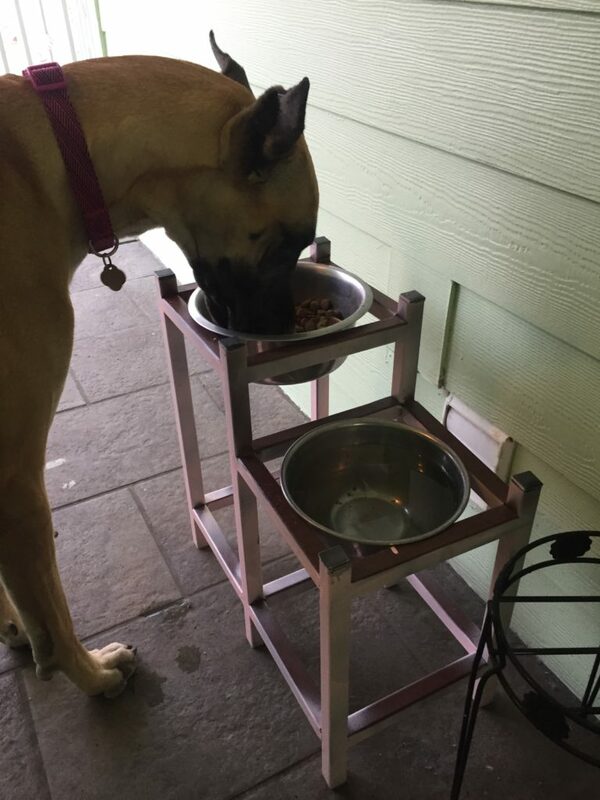 This is a good example that not all dogs fit seamlessly into their new homes, and sometimes take love and patience and good dog-sense to make it work. Not all dogs are perfect and Virginia realized that she could live with Gator’s “issues” and her love for him outweighed the problems. Thank you to Virginia for sticking it out with Gator.